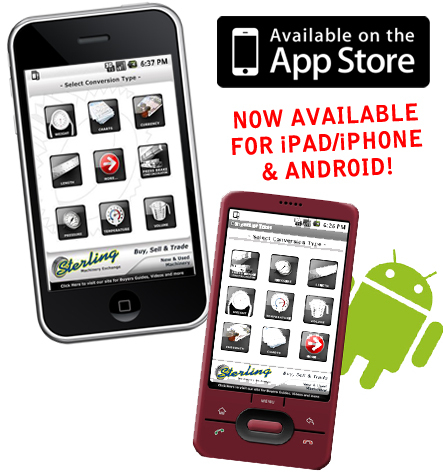 Sterling Machinery offers a "Conversion Tool"
application free of charge for both the iPhone and Android. A Collection of Calculators, Charts and Conversion tools such as: Press Brake Load Calculator, Currency Converter, Pressure Converter, Electrical Resistor Charts, New and Used Machinery Financing Calculator & More! Sterling Machinery Exchange has been a worldwide leader in the Metalworking, Chip Making, Fabricating and CNC machinery for over 60 years. We sell Press Brakes, Shears, Grinders, Saws, Rolls, Drills, Mills, Lathes CNC Machinery and More! At Sterling Machinery we Buy, Sell and Trade New and Used Machinery and Metalworking Equipment. We also offer financing as well as machinery and equipment auctions. This app includes over a Dozen Metalworking Tools, Calculators and Charts to help around the shop! - If you are looking to buy a Press Brake or Calculate tonnage our Tonnage Calculator will help you find a correct tonnage for your material thickness as well as length and die opening. Sterling Machinery Tooling Division,tooling.sterlingmachinery.com has new and used Press Brake Die tooling for sale. - Currency- Convert currency for over a hundred countries funds. - Electrical Legend to explain all the different symbols used in electrical drawings. - New and Used Machinery Financing Calculator- Sterling Machinery Financing calculator for New and Used Machinery. Use the financing calculator to Calculate Payments and term. Apply instantly and be approved in minutes for New and Used Industrial Machinery And Equipment up to $150,000. Finance Press Brakes, Shears, Lathes, Milling Machines, Grinders, Rolls, CNC Machinery, Saws, Presses, Drills. Who Uses Sterling Machinery Financing Calculator? -Companies with Good Credit and Low Cash Flow to analyze what equipment they can afford. -Machinery Buyers and Machinery Dealers use it to calculate monthly payments on any amount they are looking to finance. What can you do with the Sterling Machinery New and Used Financing Calculator app? 1. Calculate payment amount and term for new or used machinery anywhere in the USA. 2. Find New and used Press Brakes,Shears, Lathes, Milling Machines, Grinders, Rolls, CNC Machinery, Saws, Presses, Drills for Sale. 3. Apply directly from the mobile app safely and securely. Please visit our website to see more information on our Sterling Machinery Financing App, New and Used Machinery, Machinery Informational Videos, Tooling, and industrial Machinery Auctions. iPhone users click here to view the app in iTunes. the Android Marketplace by typing in "Conversion Tools". Sign in with Facebook to leave comments and feedback!